Take a long hard look at the 44-year-old man in the black-and-white film from 1965. Fast forward 45 years. The same man performs tonight, April 30, at the Gem Theater. Clark Terry continues to astound the jazz world. *Here's an excerpt from an email sent by the American Jazz Museum last week: This email is a call to action. Recently the Missouri Senate recommended zero funding for the Missouri Arts Council for FY2011. This is a distressing recommendation as the Missouri Arts Council provides significant funding to arts organizations throughout the state. About a quarter of the American Jazz Museum's philanthropic support comes through the Missouri Arts Council. *Prior to Christian McBride's concert last Saturday, Doug Tatum announced that Sachal Vasandani and Dave Brubeck have been booked as part of the Folly's 2010-11 jazz series. *Mark Southerland and Shay Estes received a quick critique. *"I wanted to see an area thriving with people, shops and things to do," a blogger writes about a visit to the Jazz District, "(A)nd what I saw were a lot of businesses that didn’t make it, closed up storefronts, lifeless streets, and the façade of a neighborhood that just doesn’t exist anymore." 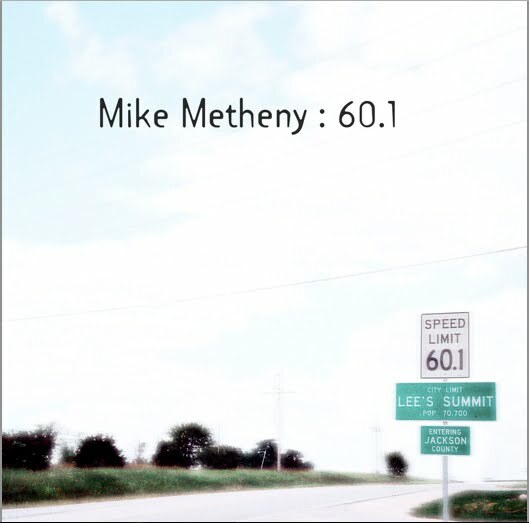 *Michael Pagan posted an enthusiastic review of Mike Metheny's 60.1 at iTunes. *Milton Morris is evoked by KCJazzLark. *The Kansas City Kansan recaps the recent "Jazz Cabaret" concert by Kansas City Kansas Community College students. *Sue Vicory provides additional details about her May 6 film premiere at the Gem Theater. *Tony Botello posted several jazz-related items during the last week. He catches up on the controversy at the Mutual Musicians Foundation. He opined on the name and venue change of KCUR's 12th Street Jump. He also checked in with Jazzbo and noted that a progressive rock band has taken up residency at Jardine's on Monday nights. Finally, the prolific blogger was on hand for Reach's live album recording with jazz/jam band Mouth at the Record Bar. *The Star reviewed the Christian McBride concert at the Folly Theater. Here's fan footage from the upper balcony. *Bobby Watson and Horizon will perform at the Detroit Jazz Fest this summer. The stellar lineup also includes Allen Toussaint, Branford Marsalis and the Maria Schneider Orchestra. *"To hell with practicality; if it’s something sweet to watch, it’s worth the challenge of creating and executing." A reviewer in San Diego is astounded by Pat Metheny's Orchestrion. *It looks as if he and Fanny have been at it since last August, but I just discovered Alaadeen's blog. *Megan Birdsall provides a new installment of her tour vlog. I've made fun of her video blogging, but seriously, similar efforts should be part of every performing artist's weekly routine. *In a typically excellent post, St. Louis Jazz Notes heralds the May 1 performance of the Count Basie Orchestra in his town. *Matt Chalk and Tim Whitmer lead groups at a May 7 charitable benefit at the American Jazz Museum. Check the Kansas City Jazz Calendar for additional listings. Panelists: NEA Jazz Master Dan Morgenstern, Barrie Hall, Clark Terry and KC Legend Alaadeen. 6:00 PM Duke Ellington Photo Exhibit and Film Exhibit Grand Opening Reception and unveiling of the Ellington bust, created by San Francisco artist, Howard Lazar. 7:00 Dan Morgenstern - “Celebrating Duke Ellington’s Legacy”. 10:00 AM Jazz Museum Tours for students w/ Dennis Winslett Glenn North. Everette Freeman on Piano; Jeff Harshbarger on Bass; Brandon Draper on Drums; James Ward on Brass; Chris Burnet on Woodwinds. Panelists: NEA Jazz Master Clark Terry, NEA Jazz Master Dan Morgenstern, Barrie Hall, KC Legend Alaadeen. Clark Terry. Gem Theater Large Conference Room. 8:00 PM Ellington Tribute Concert featuring Clark Terry, Barrie Hall, the Ellington All-Star Big Band, the American Jazz Museum Institute Student All-Stars. Clark Terry and Alaadeen will be presented with the American Jazz Museum Lifetime Achievement Award. I thought about jazz during Friday's concert by The Flaming Lips in Bonner Springs, Kansas. It didn't cross my mind as confetti rained on me. I didn't think about it as the band's vocalist scurried over my head in an inflatable hamster ball. And I forgot about it when images of naked women were projected on the screen behind the stage. But when the Oklahomans ponderously slogged through Pink Floyd-style jams I wondered why so few jazz artists incorporate crowd-pleasing theatrical elements into their live presentations. I love the Flaming Lips but I'll be the first to admit that they're not exactly the greatest band in the world. That didn't stop almost 5,000 people from paying $35 to $40 to partake of the band's generous spirit and spectacular stage show. Look at the picture I took Friday. Then look at the image I captured of Lionel Loueke's appearance at the Blue Room last November. Which show looks like more fun? There's a catch. The fifty people at Loueke's performance heard better music. Loueke's refreshing fusion of indigenous African music, pop and jazz is instantly accessible. I suppose it's a little more esoteric than the bombast of the Flaming Lips but I refuse to believe that one out of twenty Flaming Lips fans wouldn't be completely down with Loueke's slightly psychedelic sound if they only knew of him. I'm simply not willing to accept the tired adage that jazz is too sophisticated for the average person. Just like jazz musicians, the Flaming Lips are largely ignored by radio and music television. What gives? It's no mystery- the Flaming Lips put on a show. Two acts with Kansas City connections are also addressing the expectations of today's audiences. Dave Stephens has created what he calls a "jazz circus." Watch this representative video. A lot of uptight jazz snobs (I'm one of them) roll their eyes at Stephens' antics, but his routine has made him one of this town's most successful entertainers. Another Kansas City act with an emphasis on presentation is Quixotic. As seen in this video, Quixotic's Cirque du Soleil sensibility is astounding. Quixotic, Dave Stephens and yes, even the Flaming Lips, represent the competition for jazz musicians. I'm not suggesting that exotic dancers and freaky videos are the solution to jazz's dwindling popularity. But business as usual clearly isn't working. Projecting Sam Peckinpah films behind 81-year-old pianist Hank Jones obviously wouldn't work. But what does a young act have to lose? I believe there's an audience eager to embrace jazz musicians who are willing to acknowledge that it's 2010. It may be less jazz than blues and rock, but I just can't resist posting this clip of Jeff Beck performing Charles Mingus' "Goodbye Pork Pie Hat." According to a sidebar accompanying Joel Francis' feature on the British guitarist, the tribute to Kansas City native Lester Young is a staple at Beck's gigs. Here's hoping he performs it at Starlight Theater on Wednesday, April 28. *The Pitch reports that the KCUR radio show once broadcast from the Mutual Musicians Foundation has relocated to the downtown Marriott. The weekly program's new name is 12th Street Jump. *Thanks to Jason Crane's recent comment at Plastic Sax, we learned that much of Orrin Evans' new album Faith In Action serves as a tribute to the compositions of Bobby Watson. Evans talks about his relationship with Watson in a The Jazz Session podcast. *Guitarist Will Matthews was featured on KCUR's KC Currents. Download the show here. *"I've always felt a big part of my job is to irritate those people," Pat Metheny says of jazz purists in a new 8-minute feature on NPR's Weekend Edition. "When I'm not doing that, I feel I'm not doing my job." Listen here. *"Fits and starts, plans, failed plans, announcements, withdrawn announcements," writes KCJazzLark. He continues the story of the painful path that led to the creation of the American Jazz Museum in parts four and five of his invaluable history. *Dan White, the photographer behind the “The Fine Art of Jazz" exhibit at the Central Library, is profiled by Rick Hellman. UMKC's newspaper also interviewed White. *One of Norah Jones' drummers and ex-Kansas Citian Mike Dillon were in Ani DiFranco's band when she played the Beaumont last week. The Star sent a jerk to review the show. *Sue Vicory reports that acclaimed pianist Billy Stritch, a star in his own right, will accompany Marilyn Maye at the May 6 premiere of Kansas City Jazz & Blues: Past, Present & Future at the Gem Theater. *Here's video documenting one of Kansas City bassist Jeff Harshbarger's first official performances as a member of Jacob Fred Jazz Odyssey. It was filmed at Starship Records in Tulsa on April 17. *The Star provides a review of the Clayton Brothers recent concert at the Gem Theater. *Take a look at the flier for the May 2 KC Youth Jazz fundraiser at the Madrid Theater. Here's a press release about the event. *A North Carolina newspaper conducted a rather uninspired interview with Karrin Allyson. *The sad news that the 2009 Rhythm & Ribs Festival had been canceled hit a year ago this week. I'm eagerly awaiting news about the status of the 2010 event. Until then, Denver offers a solid backup plan. A June festival in that city has a strong Kansas City flavor. Bobby Watson and Karrin Allyson are among the headliners at June's JazzFest Denver. *From Tim Whitmer: 9th Annual Plaza Rotary Jazz Cabaret, April 25, Gem Theater: Led by Master of Ceremonies Tim Whitmer, the 2010 Cabaret will be a Jazz Extravaganza featuring the legendary Wild Women of Kansas City featuring Myra Taylor, Millie Edwards,Geneva Price and Lori Tucker and the one and only Wild Man, Bill Maness. Tim Whitmer and the Jazz Cabaret All Stars will open. Included will be James Albright, Jurgen Welge, Jim Mair and Stan Kessler as well as Whitmer on the Steinway piano. *From Candace Evans' publicist: Candace Evans will be returning for her 4th engagement at the beautiful Lodge of Four Seasons resort at the Lake of the Ozarks on Memorial Day weekend, and will be performing every Thursday, Friday and Saturday evening throughout the season. Also, Candace will be performing again for this year's Dream Factory benefit at the Ritz-Charles Hotel in Overland Park KS on Friday April 30. I may never forgive Mike Metheny for making my life a living hell. The opening track of 60.1, his new album, may be the most infuriating earworm I've ever encountered. It's as if the tormented ghost of Raymond Scott had assumed control of the USC Marching Trojans. The deliberately annoying march has taken up unwelcome residency in my cranium for the past two weeks. Metheny named the piece "Dubious Melody," but "Crime Against Humanity" would be be a more appropriate title. It takes enormous talent to be so maliciously awful. At this late date, jazz fans could be forgiven for failing to remember that Metheny was once a major label recording artist and had served as a faculty member at Boston's Berklee College of Music. While Metheny has returned to Missouri and jazz's fortunes have waned, Metheny's prodigious musical gifts have not diminished. The evil "Dubious Melody" aside, Metheny uses his genius for good on 60.1. Propelled by drummer Brandon Draper, the title track is absolutely savage. It demonstrates that Metheny is still capable of making a righteous racket that can challenge the testosterone levels of even the most manly fans of Medeski Martin & Wood and The Bad Plus. "60.1" and a couple additional noisy numbers make the album's relatively conventional mainstream tracks seem tame. It would be a shame, however, to overlook Metheny's gorgeous playing on the Bill Evans ballad "Laurie" and the fine Bob Bowman solo on "C.C. & Water." Other Kansas City-based artists on the album include pianists Paul Smith and Roger Wilder and guitarist Danny Embrey. Metheny demurred when I asked for permission to post a track. All ten selections are different, he suggested, and hearing only one piece would be inherently misleading. There's some truth to that. Even so, the entirety of 60.1 s characterized by Metheny's artistic restlessness, adventurous spirit and stupendous musicality. Just don't listen to that first track. With all due respect to Bobby Broom, drummer Kobie Watkins completely dominates the guitarist's trio in the embedded video. Watkins doesn't feature quite so prominently in shaky fan footage of a recent Sonny Rollins concert, but no one is about to upstage the great saxophonist. Joe Klopus recently raved about Watkins. The drummer leads a band at the Blue Room on Saturday, April 17. *Longtime Kansas City jazz favorite Pete Eye has died. Here's his obituary. This newly uploaded video of Eye at a 1986 wedding reception will have viewers smiling through their tears. *Charles Perkins, perhaps the finest living Kansas City jazz artist who's managed to hide his formidable talent from the internet, can finally be seen on video. *KCJazzLark continues to entertain and enlighten. He offers a review and photos of Junior Mance's gig at the Blue Room. In a separate post he toasts the new release by Mike Metheny and roasts the feeble marketing efforts of a couple jazz venues. *I've seen it with my own eyes. The Kansas City Strip trolley stops at 18th & Vine on Fridays and Saturdays. A "daily pass" costs $15. *An obviously delirious critic reviewed Karrin Allyson' appearance at Jardine's last week. KC Confidential also covered Allyson. A blogger chimes in here. *"I see people that are hungry waiting for their mail/Hoping that their loved one is not in jail!" Sellie Truitt's new video for "Save Our Saturdays" has to be seen and heard to be believed. *Joel Francis caught up with Greg Ginn. *Here's live footage of Megan Birdsall's MBird project. *Dean Minderman, the man behind the excellent St. Louis Jazz Notes, is displeased by the 2010-2011 jazz season at Sheldon Hall. Don't be surprised if some of the same acts appear on the Folly Theater's next jazz series. *From Fanny Dunfee: The American Jazz Museum will pay special tribute to the Jazz legacy and genius of Duke Ellington as well as, honoring Clark Terry and Kansas City based Jazz Legend Alaadeen. Thursday, April 29th (Ellington’s 111th Birthday) is Ellington Education Day at the American Jazz Museum's Blue Room starting with a 10:00 am panel session with Dan Morgenstern (moderator), Barry Hall, Clark Terry and Alaadeen. On Friday, April 30th, the 2:00pm panel session will be “The Genius of Duke Ellington: Goin’ to Graduate School – A Players Perspective”. Panelists include NEA Jazz Master Clark Terry, NEA Jazz Master Dan Morgenstern, Barry Hall, and KC Legend Alaadeen. Moderating is Greg Carroll, American Jazz Museum Chief Executive Officer. The Ellington Alumni All-Stars open rehearsal with Barry Hall, Clark Terry and Alaadeen is set for 4:00pm Friday at the Gem Theater in Kansas City's Jazz District. The culmination of the 2 day celebration will be the presentation of the American Jazz Museum's Lifetime Achievement Award to Clark Terry and Alaadeen at an 8:00pm Ellington Tribute Concert at the Gem Theater. The concert, will feature Clark Terry and Alaadeen with the Ellington All-Star Big Band. Also performing will be the American Jazz Museum Student All-Star Band and selected high school big bands. *From Brad Cox: On May 1 (International Workers' Day), 2010, The People’s Liberation Big Band of Greater Kansas City will perform the ensemble's original score to Sergei Eisenstein’s classic 1925 silent film “The Battleship Potemkin.” Along with a complete screening of "Battleship Potemkin," the People's Liberation Big Band will also accompany two short films as a prelude to the performance. Composers and arrangers contributing to the project include P. Alonzo Conway, Brad Cox, Jeff Harshbarger, and Jeffrey Ruckman. The People’s Liberation Big Band’s score, which contains newly composed material, free improvisation, and arrangements of Shostakovich melodies, was premiered last year on May 1st, and was named as one of the best music events of the year by Bill Brownlee, special contributor to the Kansas City Star. The performance will take place at the Paul Mesner Puppet Studio (1006 Linwood Blvd, Kansas City, MO 64109) at 8:00 p.m. Ticket price is $15, $10 for students. 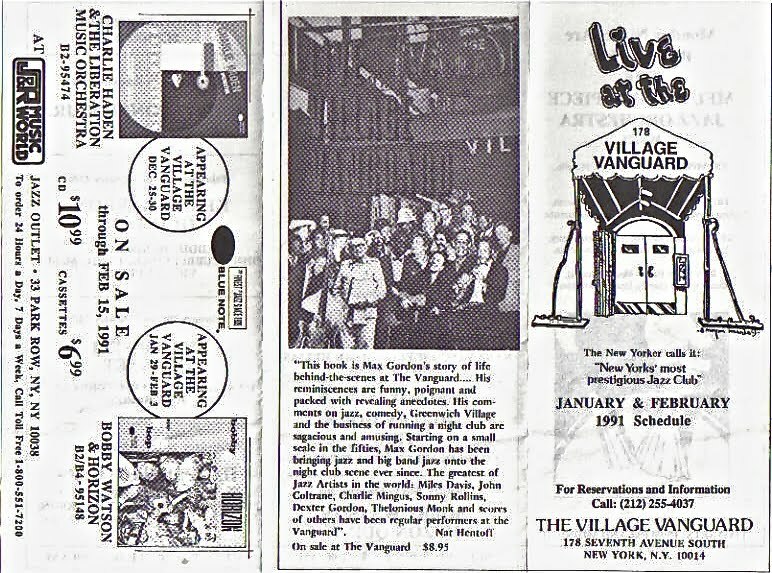 I came across an old calendar for the Village Vanguard while doing some spring cleaning. 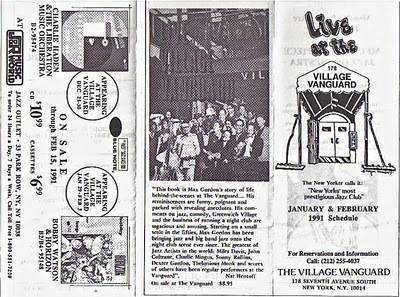 I'd tucked it inside a travel guide I'd used on my first business trip to New York in 1991. I'd been giddy about making a pilgrimage to the jazz mecca. I was disappointed. Its storied history aside, the Vanguard is just another room. I recall thinking that Kansas City had several jazz clubs that were superior to the Vanguard. They're gone now. Does this old flier indicate that "things ain't what they used to be" or is it a case of "the more things change, the more they stay the same"? It's a bit of both. Ed Blackwell died the following year. Shirley Horn died in 2005. Otherwise, the bookings could pass for 2010. 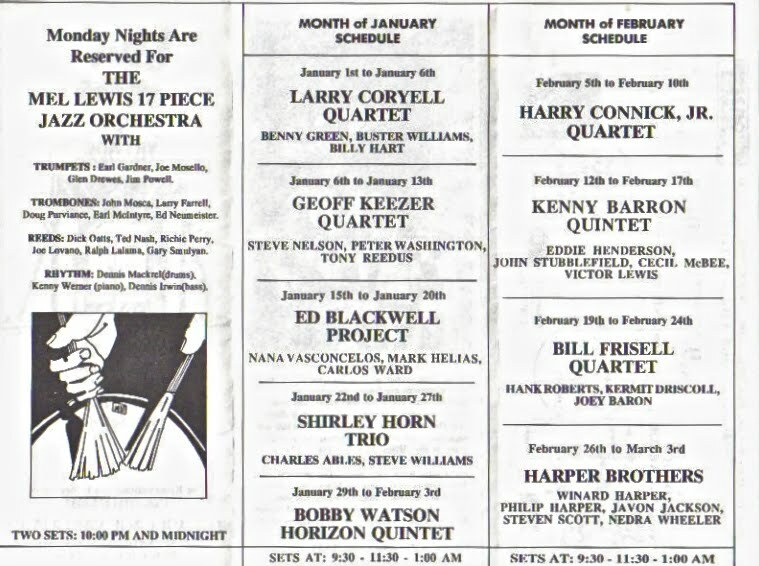 Mel Lewis passed in 1990 but his orchestra still plays the club on Mondays. Bill Frisell even returns to the Vanguard next month. Kansas City's Bobby Watson is, of course, still very much with us. The only sign that jazz was less unpopular nineteen years ago is the Blue Note label's advertisement for Watson's latest album. The cassette was only $6.99! While other videos of Hal Galper are available, I couldn't resist posting this clip of the pianist accompanying the great Joe Lovano. (Galper's solo commences at the 3:30 mark if you're compelled to skip ahead.) Because I've seen Galper perform as a member of Phil Woods' group, I can attest to his brilliance. Galper plays Saturday, April 10, at the Blue Room. *David Martin reports that Bobby Watson, Jayne McShann and Joyce Johnson resigned from their positions on the board of the Mutual Musicians Foundation. *Steve Penn provides quotes from Oscar "Lucky" Wesley's February 27 appearance at the American Jazz Museum's "Jazz Talk." Wesley is mourned in a letter to the Star. Elsewhere, a music blogger features a track from an obscure album by The Scamps. *The significance of Sue Vicory's film is heralded by KCJazzLark. The jazz blogger also reviewed a recent performance of the New Order Big Band. *Chuck Haddix discusses the jazz and blues photography of Dan White on April 14 at the Central Library. The Jim Mair Quartet with Mike Ning, Tyrone Clark and Michael Warren will perform at the event. *Diverse created a Kickstarter account to help fund a European tour. *The Star reviewed Junior Mance's gig at the Blue Room. Paola's Ryan Anselmi and Hutchinson's Kim Garey were in the pianist's band. *A memorial in the Washington Post suggests that the late Herb Ellis once lived in Kansas City. A handful of area musicians have disputed that claim. *MBird, the alter-ego of jazz vocalist Megan Birdsall, has issued a music video. *Russell Thorpe of Black House Improvisors' Collective is now blogging at Phonologotron. *The Wall Street Journal attempts to decode Pat Metheny's Orchestrion. *Karrin Allyson returns to Kansas City this week for a two-night run at Jardine's. *The Guardian continues its Charlie Parker obsession. *From Jim Mair: A gathering to honor the life of Theodore Jan Wilson, featuring a tribute by Kansas City jazz musicians, will be held at 2 pm Tuesday, May 4, 2010, at Kansas City Kansas Community College's Intercultural Center. The public is invited. *From a Kansas City Kansas Community College press release: Coming off unprecedented success in the annual Pittsburg State Jazz Festival, where the KCKCC Jazz Band and two combos earned No. 1 ratings, the Jazz Band under the direction of Jim Mair received an invitation to perform at the Puerto Vallarta Jazz Festival in Mexico next February. Maybe I've been making everything too complicated. Instead of worrying about what qualifies as jazz, perhaps I should embrace the notion that any act booked at a jazz club is, by definition, a jazz act. Mixed Method perform at Jardine's on Saturday, April 10. An email interview I conducted with the quintet follows. Plastic Sax: Your music seems like equal parts jazz, electronica and progressive rock. Is that a fair characterization? How would you describe your sound? Mike Malaker: That's a good description, but you might throw in dub, funk and Afro-Caribbean into the mix as well. I'm sure there are others. We are all about combining our influences into new forms. Ryan Nilson: Yes that description sounds pretty fair. Our sound is really just a mix of what we listen to and like. Sometimes this eclectic influence works and sometimes it does not. There are times when we all are like "yeah, this is awesome" and other times we are thinking "what are we doing?" J Witzgall: Well, there are a slew of European bands, Jaga Jazzist, Sayag Jazz Machine and others that mix electronica with Jazz and rock. We have a similar sound. In the beginning, we went for a little harder electronica sound. Not having a drummer and using mostly breakbeats pushed us closer in that direction. Now with a drummer, we are able to sound much more like our other influences, spilling over into John Scofield-ish funk and prog rock/math rock stuff among others. PS: I detect a King Crimson influence in your sound. Am I crazy? RN: I don’t listen to King Crimson. MM: That's interesting. They are one of my early influences, though I never consciously thought of them as part of this band's sound. JW: When I was a kid, in the Washington D.C. suburbs, Robert Fripp had just started the Guitar Craft workshops in an old school/monastery for the Gurdjieff philosophy that Fripp was into at the time, so we went out to see the first Crafty Guitarists concert, and we went and talked to Fripp, and one of my friends who had come with me thought it was kind of stiff, and told me he was going to advise Fripp to buy Elvis' Sun Sessions to get some inspiration to loosen up, but at the last minute, he chickened out. What's funny is that a few months ago I was reading a book by a Guitar Craft student, and I come across a passage where Fripp is listing his favorite albums and his #1 favorite album turns out to be Elvis' Sun Sessions! Anyway, we don't deliberately try to sound like King Crimson, but it probably creeps into our sound without us being aware of it. PS: What are your musical influences? And what's the background of the band's members? RN: Major group influences are: Cinematic Orchestra, Erik Truffaz Quartet, Jaga Jazzist, Jojo Mayer’s The Nerve, and Sayag Jazz Machine. We all have various levels of jazz and classical training and education. Besides Todd (the drummer) none of us are really on the Jazz scene in KC. MM: I'm primarily a self-taught guitar player. My earliest influences were progressive rock, and then I gravitated to post-punk sounds such as Television, Gang of Four and Wire. I loved the DIY aesthetic and using music as a means of personal expression instead of pursuing virtuosity. However, about 12 years ago, I realized that relying solely on my ear and intuition wasn't getting me where I wanted to go musically. I decided to pursue formal training and studied jazz guitar with Frank Rumoro and later with David Bloom, both excellent instructors from Chicago. JW: All of us are or were involved with jazz to some degree. I'm into really out/avant/confrontational stuff, Ryan is into groovy hypnotic electronica - mostly drumnbass, Todd is into math-rock and technically challenging stuff. Nick is into that early Miles On the Corner kind of stuff. PS: Material like "Unisound" is cinematic. Do you think of your music in a visual sense? RN: Yes, we do want a cinematic quality to our music. We want it to give off a vibe or feeling much of the way a movie sound track sets the stage for what is going on in the film. MM: For me, I'm really just thinking about the music without any external references. However, I believe music is most effective when it can invoke images in the listener. JW: We are sort of heading in that direction. Most people when they are to the point of listening to music as organized sound, without any preconceptions of who's performing it, they'll draw visual images from it; they'll relate to it visually. PS: A note at your site suggests that Mixed Method took time off to "reinvent themselves." What's that mean? And why did you feel you needed to change? JW: Well, honestly we just got bored with what we were doing, and we were kind of stuck in the cycle of rehearse/perform/rehearse and we didn't really have time to develop or write new material. RN: Everything we had done up to the EP was based on tracks of electronic beats we created and that the band played over. That method worked very well for us but it was a really rigid way to make music. We wanted to look at adding a live drummer and that meant redesigning the roles in the group and the way we played. We had to write all new material and figure out how we work as a group with a drummer. I think we are still trying to figure this out in many ways. Right now our music is even more diverse than before. It will be interesting to see where things head as the band continues to work together. MM: Having Todd in the band has increased the energy level enormously. We still have electronics as a large component of our sound, but having a live drummer gives us so much more flexibility then we could ever get with programmed tracks. PS: I love conventional acoustic jazz. It's my belief, however, that jazz must incorporate outside influences and new sonic textures in order to avoid becoming a Dixieland-style museum piece. Do you agree? And if so, do you view "saving jazz" as part of your mission? RN: We all really dig traditional jazz too. There are so many amazing jazz musicians in KC playing at a very high level of skill and sophistication. We are not saving jazz, we don’t even claim to be jazz in a traditional way. If you want to see amazing jazz chops or mind-blowing solos you are not going to get that with us. The fact is that when play instrumental music with our instrumentation you get a jazz label and we are ok with that. MM: We all love jazz, but I think of Mixed Method as a group that plays modern instrumental music with jazz influences. This isn't really a jazz project per se. JW: I think that Jazz is already a museum piece. It doesn't need to grow to survive. It's like opera. PS: Is Kansas City an accommodating base for an act like Mixed Method? RN: Yes, KC has been pretty good to us. JW: Apparently - we seem to get shows. MM: So far, so good. I've only been in KC for a little over 5 years. I moved here from Chicago, which has a phenomenal music scene. However, I really like the vibe of this town. There is a lot less attitude here, and the music scene is really diverse with many outstanding players. PS: Would you rather play for an audience of 500 people in a dance club or for 100 beard-scratching jazz fans? What is Mixed Method's ideal audience? MM: 600 dancing, beard-scratching, jazz fans! JW: What's funny is we've done both now. But the ideal audience is the one that gets us. People in both environments seem to get it. RN: Our ideal audience is folks who take our music for what it is, and don’t try to corner us into a genre. PS: Jardine's lists your April 10 show as "Underground Sounds." Do you agree with that assessment? RN: Yeah, I guess. We are playing the show with Hominid which is Hunter Long’s solo electronica act. We are happy Jardine’s is giving us a chance to play. MM: This will be our second show at Jardine's. It is really encouraging that Jardine's is hosting diverse acts such as ours. We are grateful to be able to play at such a prominent venue. PS: Suppose a sixty-year-old Ida McBeth fan decides to stick around after her early show at Jardine's on April 10. What will that person make of Mixed Method? RN: I have asked myself the same question. MM: That all depends on what other sounds they like. Purists will probably not get our thing, but that's how it goes. Junior Mance recalls the funeral of Kansas City native Lester Young in this brief video. The 81-year-old pianist performs Saturday, April 3, at the Blue Room. Joe Klopus offered a nice preview of the show.